The next Reading Loop will take place on Wednesday June 29th, 6pm, at Site Gallery Canteen. 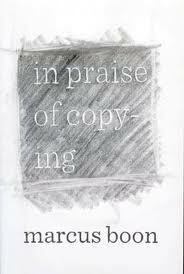 We’ll be discussing Marcus Boon’s text, ‘In Praise of Copying’ (published by Harvard University Press in 2010). You can (legally – hurrah!) download a copy of the whole book here. Marcus Boon, In Praise of Copying (Harvard University Press, 2010). Next Next post: We like… an excellent lecture by Noam Chomsky!